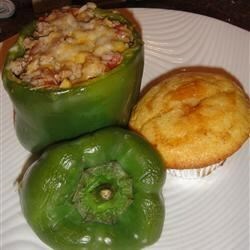 "This is a twist on the traditional stuffed green pepper recipe." Not at all a fan of fennel. Pretty decent other than that, but I cannot get past that flavor! This was EXCellant! We LOVED it and I did not change a thing!! YUMMY I will definately make this again. Thank you.